I started writing when I was in the fourth grade. At that time, it was a way to express difficult emotions and things I did not understand. Since then I have always written for that purpose. I did not start writing for others until I became a therapist. The first story I wrote as a therapist was called “Sneaky Pee.” I wrote it to help a child who was struggling with enuresis. Afterwards, I wrote many therapeutic stories to help my young clients, but I was not interested in publishing any of them. In 2012 I had an experience with a young fellow that showed me the importance of writing stories not only for my young clients but for other children who had lived through the same sorts of traumas. I started writing therapeutic stories for others at that point. “The Gift” did not start out as a healing story. My initial thoughts about it were about a girl and a horse. However, my brain created a story with many therapeutic elements. 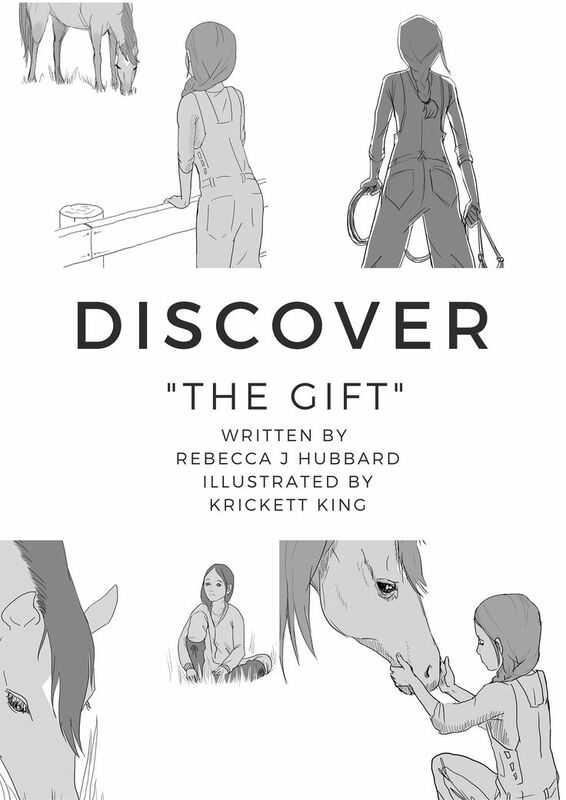 So although “The Gift” is a story about friendship, it is also a story about understanding the perspectives of others, being self-aware, learning how you impact others, how your thoughts influence your emotions and behaviour, and perseverance. The most influential people as an author are my young readers and the lack of books available on the traumas that they have experienced. I write to help my young clients and others understand that they are not alone, and there is hope. Ninety-nine percent of the books I have written are for children who have had very traumatic things done to them or who have had terrible things happen to them. For example, one of my books is about filicide – when a parent murders a child. Due to the delicate nature of this material it has been difficult to find a publishing home. The seed for this book came from watching an interaction between a girl and a horse. The girl desperately wanted to be friends with this horse. I watched the girl try everything she knew to get this horse’s attention and the horse ignored her and acted as if she did not exist. A year later the same girl and horse had a beautiful moment of connection. It was rewarding to see the joy she felt and the warmth and kindness in the horse’s eyes and body. Seeing this girl’s heartbreak and joy, as well as my curiosity about the animal’s response, lead me to write this book. The nominees for The People’s Book Prize are voted for by the readers, how important are your readers to you? Ravenswood publishes a variety of brilliant authors, what is it like to be in the company of talented writers? I am in awe and still feel like it is a dream that I am a published author and in such esteemed company. It also produces a desire to improve my craft and to learn as much as I can to be a more compelling storyteller. The book that changed my life the most is “To Kill A Mockingbird” by Harper Lee. The book that most influenced how I write is “One Child” by Torey Hayden. She has a wonderful way of helping readers understand the experiences, emotions and motivation of children that are hurting. At the moment I am reading “The Wolf Wilder” by Katherine Rundell. You can expect that I will continue to write therapeutic stories. I am working on a second Pip and Buck story called “Pip and Buck: Saddle Up!” I am also working on a middle-grade novel about four children and their schizophrenic mother. The mother’s schizophrenia leads her to believe that the woods where they live is full of monsters that will eat her children. So, she hides them away in their home. Her desire to protect her children is strong but at times she does things that frighten them. Her children do not understand her illness and also think monsters roam the woods. When concerned townspeople get involved, the kids hide in the forest long enough to discover if the townspeople are the enemy, or their mother is truly ill.
Reblogged this on hopeful scribe.